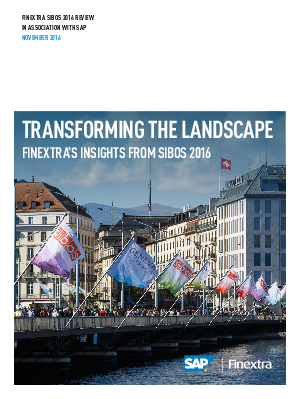 This whitepaper provides an overview on technology dominated discussions at Sibos 2016 to an extent we have not seen previously. Historically, Sibos has been an event attended largely by bankers focusing mainly on business issues, while technologists have played a supporting role. This year the roles reversed to reflect a focus on the ever-increasing importance of technology in shaping the future of the financial industry. After years of absorption in complying with post-financial crisis regulation, banks have taken a look at their technology estates and realised the importance of bridging the gap that has grown up in order to better deliver value to their customers and continue to drive out operational cost and complexity. Banks now need to respond to new entrants by harnessing technology to offer compelling customer propositions and disrupt incumbent businesses with competitive new models. The regulatory theme naturally remained part of the discussion in Geneva. Interestingly, one of the most talked-about pieces of regulation was PSD2 – itself a catalyst for technology-driven disruption through its introduction of open banking underpinned by open APIs.